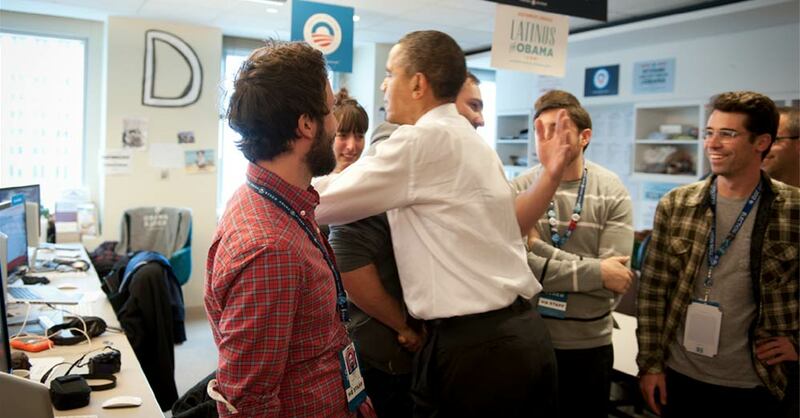 After election day, everyone at HQ got a handshake and hug. I hadn't bathed in 2 days. He was cool about it. 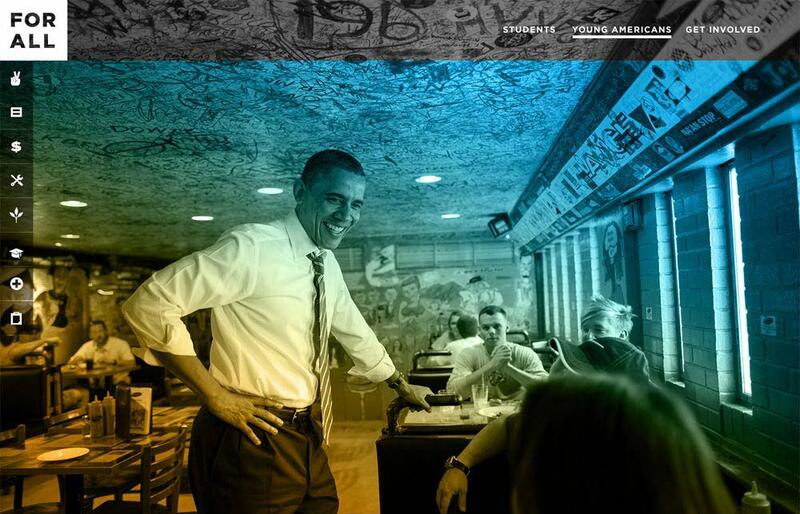 "I want you to redesign barackobama dot com". I'll never forget hearing Design Director John Higgins say that to me. It hit me in stages. The first thing I thought was 'What an opportunity!' which was followed quickly by 'If I screw this up, it will be the most profoud failure of my life'. So y'know, no pressure. 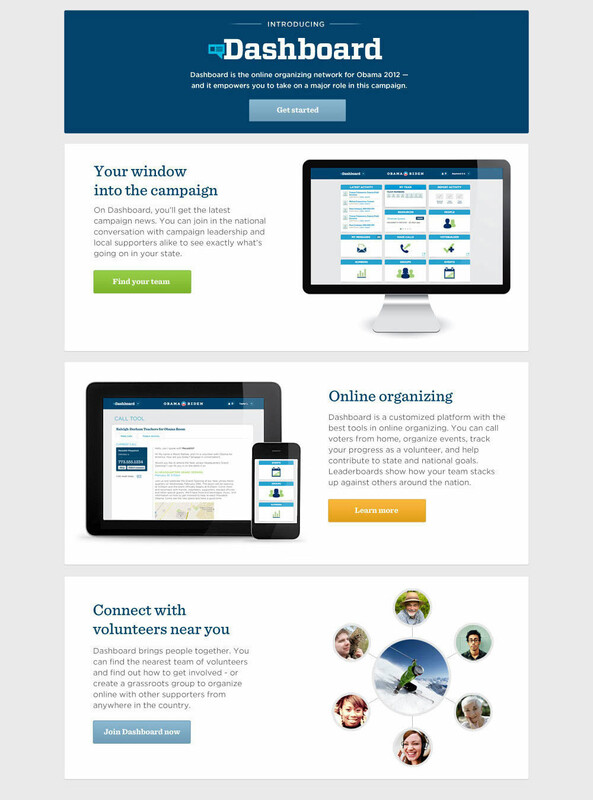 With accessibility as our North Star, we organized the most basic levels of engagement into three clear buckets: "Get the Facts", "Get the Latest", and "Get Involved"; creating a minimal header that left little room for confusion. The header area needed to accomodate several featured items or events, but we were careful to preserve hierarchy and always let the top item stand out visually. 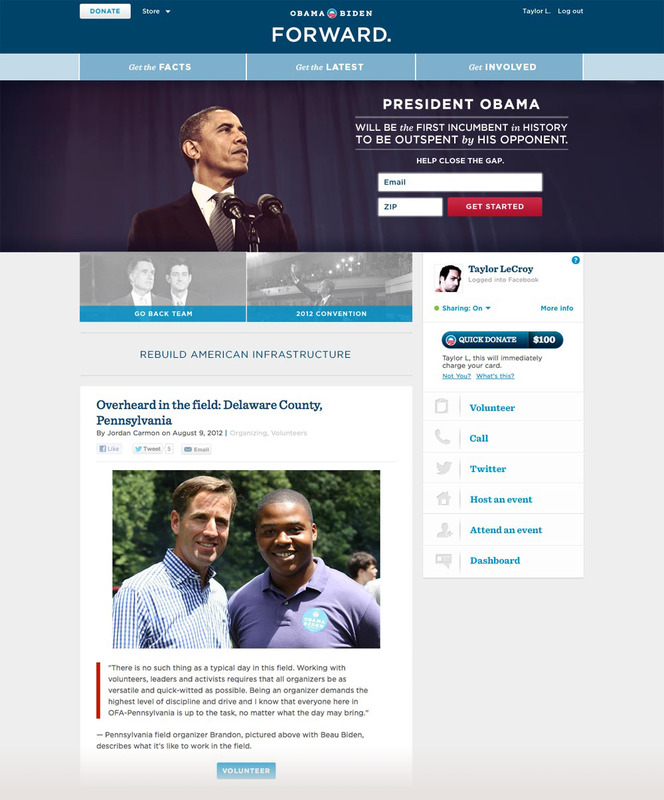 We created an area directly beneath the full-width image dedicated to secondary topics and an overview of the President's stance on major issues, then dedicated the sidebar to quick donation, social sharing and a host of ways to get involved. 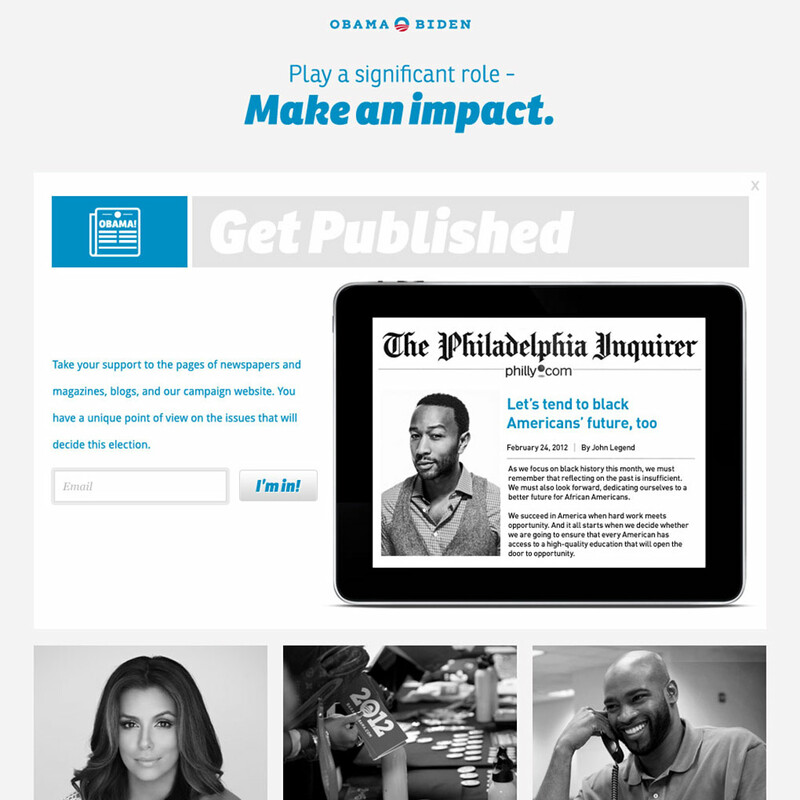 Below that, a cascade of recent stories presented further opportunities to get informed and share news. 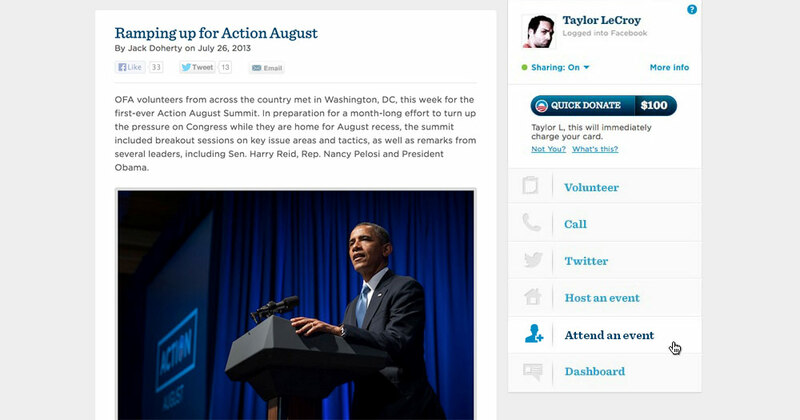 The sidebar stayed fixed as users scrolled, making it easy to engage without going back to the top. 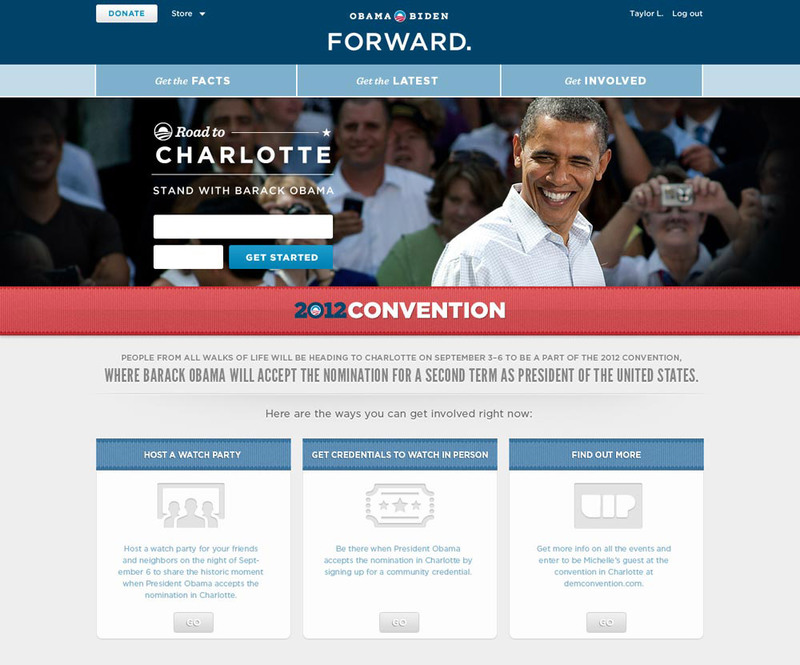 For major events like the convention, we were able to execute page takeovers in hours thanks to an always-on frontend development team. 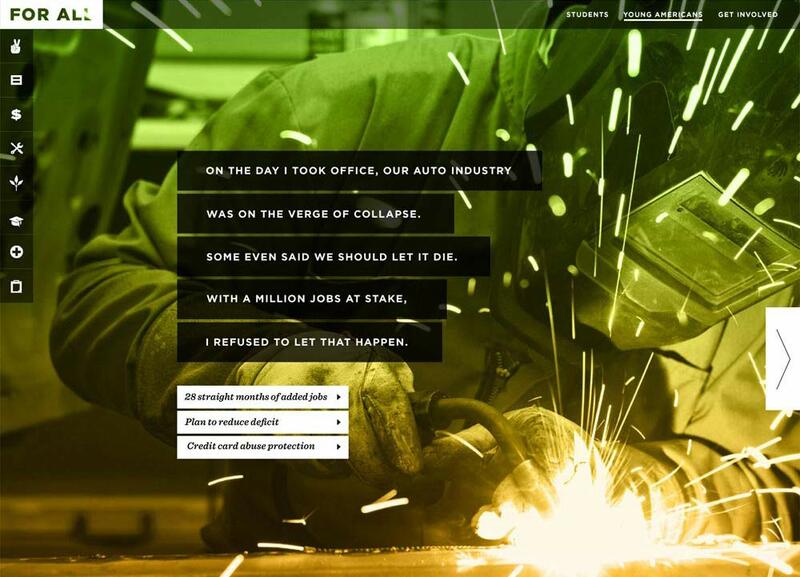 Templates had to accomodate any location, date and time while staying true to the brand look and feel. On the morning of my third day at the campaign I was walking to my desk when someone stood up and introduced himself. His name was David Osborne, and he was the Product Manager on something kind of secretive which at the time was being called WIRE. Someone had told David that I was the new digital designer who could handle the project, and I was happy to play along. What would follow was a year and a half of daily check-ins, puddles of blood sweat and tears, and three complete css re-writes of production code that was shipped to thousands. The goal of the project was to organize the campaign's massive ground network of neighborhood teams into a centralized digital hub. They needed to be able to do everything they could do in person, but quicker and easier, and it needed to work for grandma just as well as a tech savvy college student. Dashboard MVP. We shipped it to thousands. They hated it. We started over. And boy oh boy, did they hate it. We frantically tried to identify and address the most important issues through a small but tireless support team that had tickets pouring in left and right. Volunteers were threatening to dump the product and go back to excel spreadsheets, and stakeholders within the campaign were getting restless. So we did the only rational thing and scrapped the entire codebase and started over. We flew in volunteers and team leaders who needed to use Dashboard and did videotaped sessions right at HQ. We decided to take an entirely different approach to the navigational structure, arranging the different tasks and displays into a grid of tiles, many of which would display live data akin to a traditional dashboard. Once clicked, the tiles expanded into deep dive views of the various sections, all tailored to the user's position within the network. 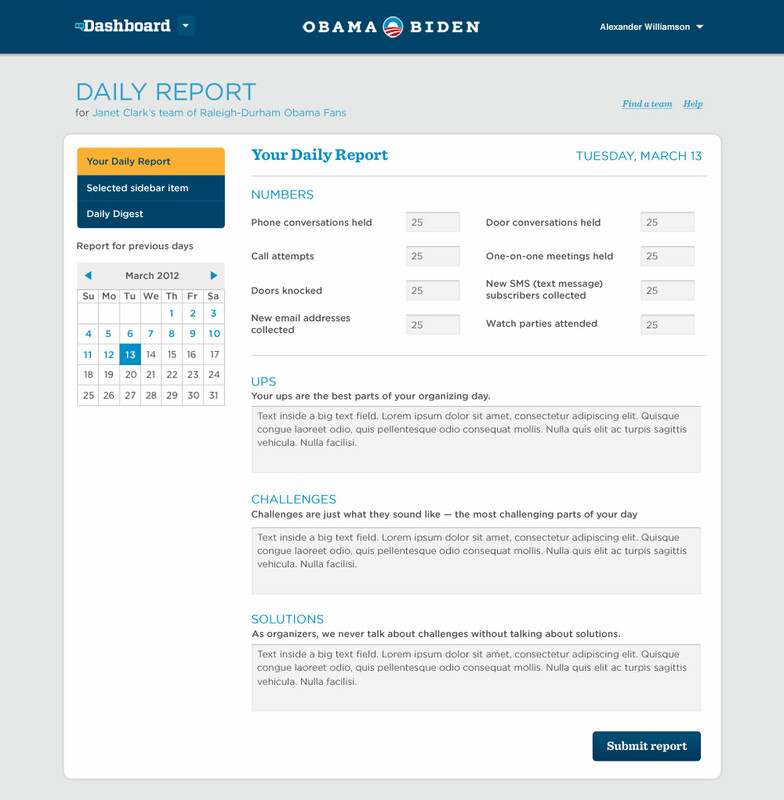 Dashboard v2. People hated it less. We were getting somewhere. One big feature that had to get done as soon as possible was the Call Tool. We knew that if we could make the experience of cold calling a stranger a little more comfortable, we could move the needle for the President in a big way. 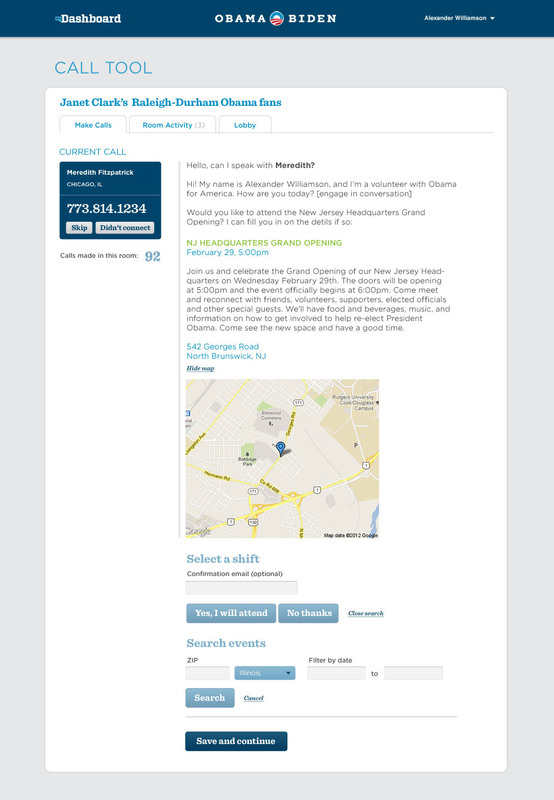 The call tool would provide volunteers with numbers to call and a loose script to follow. I wish I'd saved screen grabs of the previous version. Picture a usability nightmare that you had to squint to read, cluttered with confusing options. 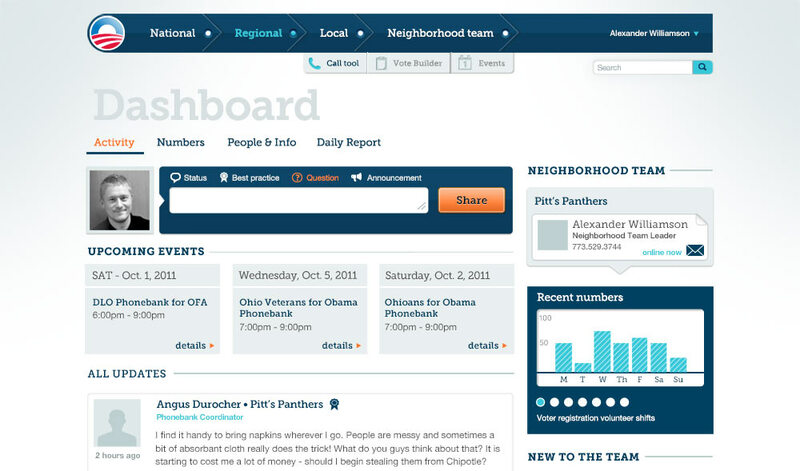 The redesign would live as a feature within Dashboard rather than a standalone app, so the visual language had to match. 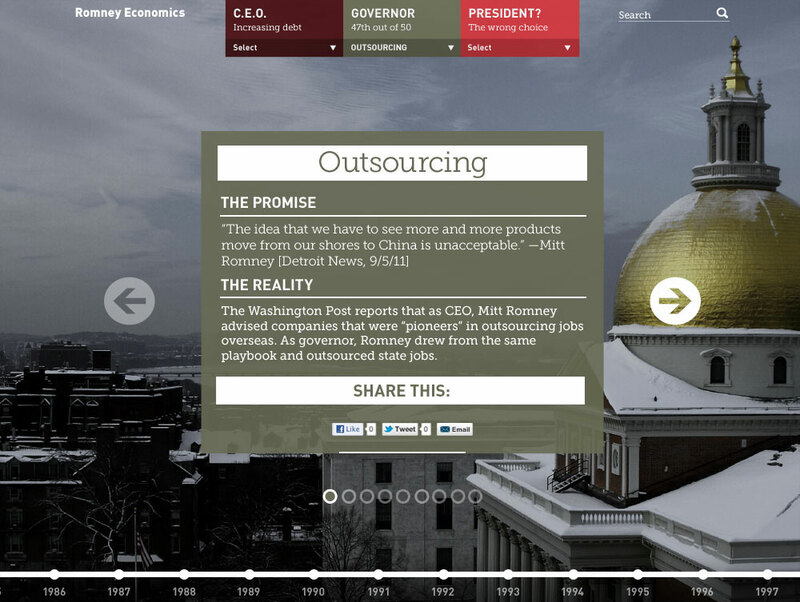 The launch coincided with a plummet in bounce rate and big boost in pages/visit. 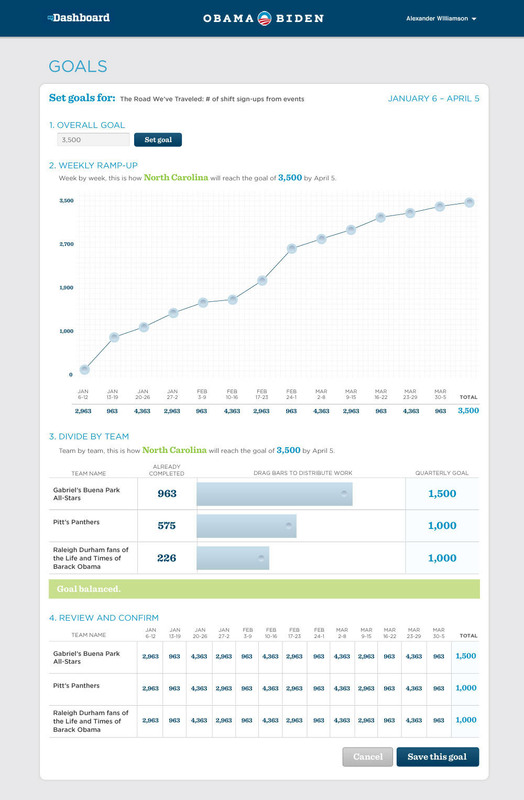 Most of the work volunteers were doing on Dashboard involved reporting and recording data so that regional managers could easily see which teams or team members were performing well and which needed shoring up. The challenge in designing the interface was that the information shown varied widely in complexity based on the "rank" of the volunteer. Below is a goal setting interface for a manager of an entire region. The controllable graph points allowed them to distribute segments of an overall goal week-by-week in order to arrive at a predetermined total. At the same time, neighborhood-level volunteers needed a way to report their daily activity up the chain, including general commenting fields to describe what was working for them and what wasn't. 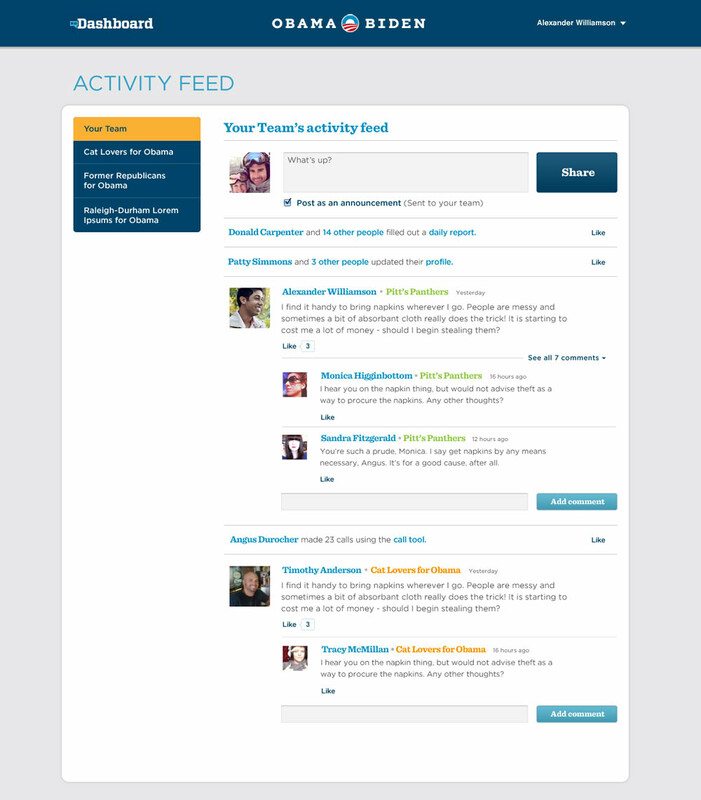 A different tile housed an activity feed for communicating directly with other members of your neighborhood team. 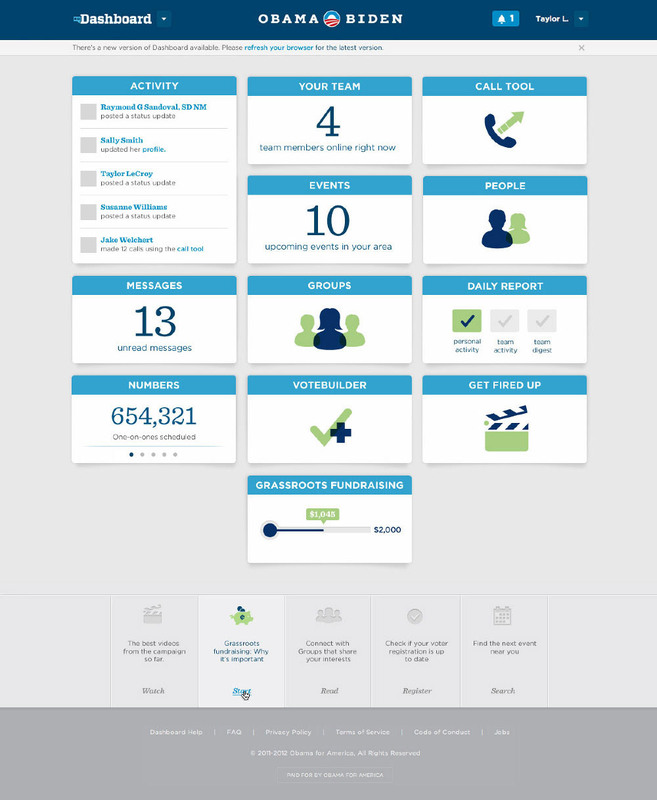 All told, working on Dashboard is probably the most fun I've had working on any one project. 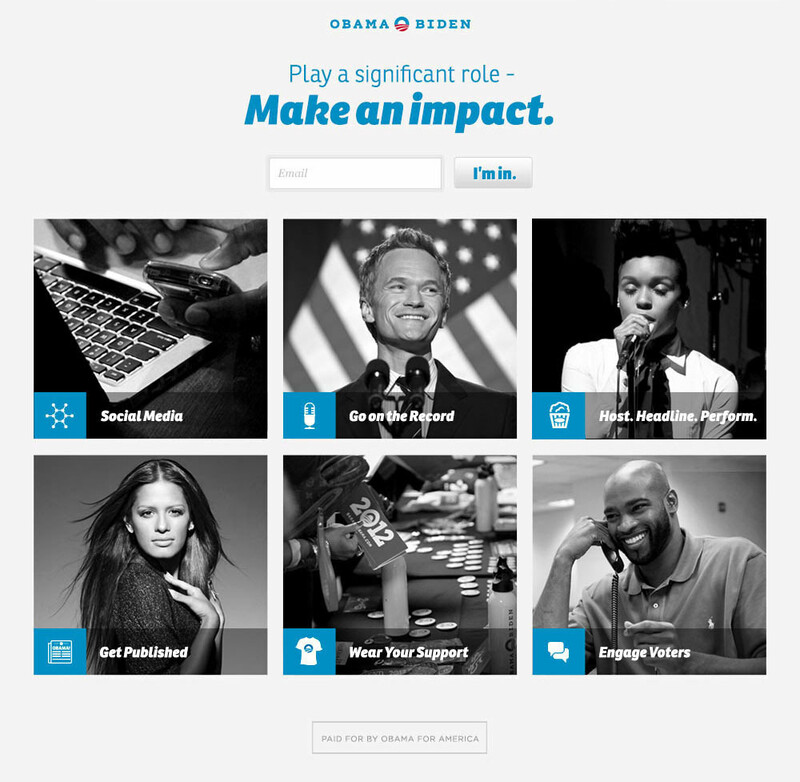 There were many hard times and a lot of pressure, but in the end we had over 300,000 unique accounts doing work daily to help the reelection effort, and I believe it made a difference on election day. 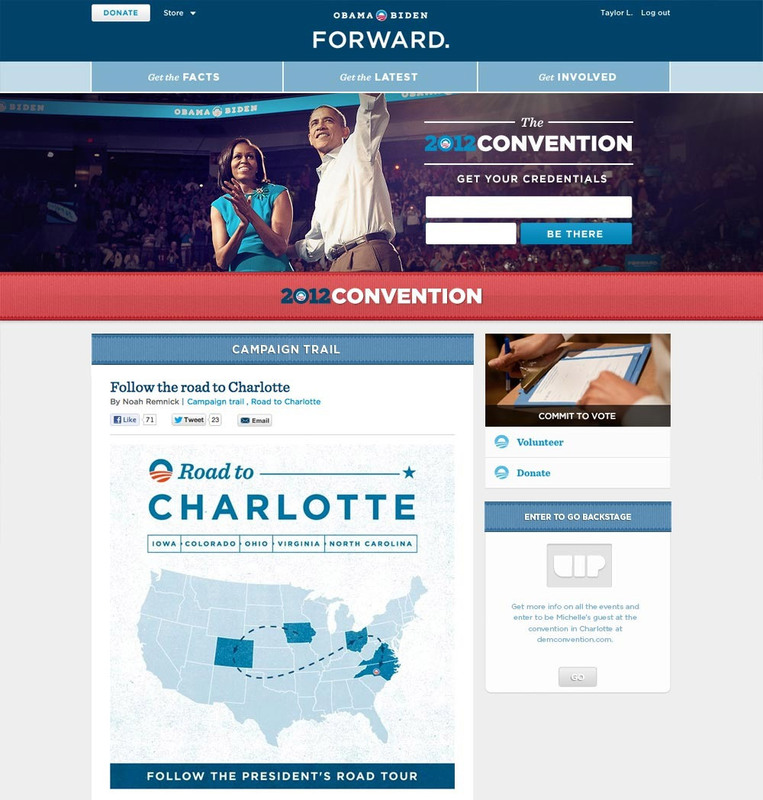 A major presidential campaign had many different departments: Field teams, Surrogates, Opposition Research and may more. Each of these departments had its own needs and more often than not, those needs included a website of some sort. 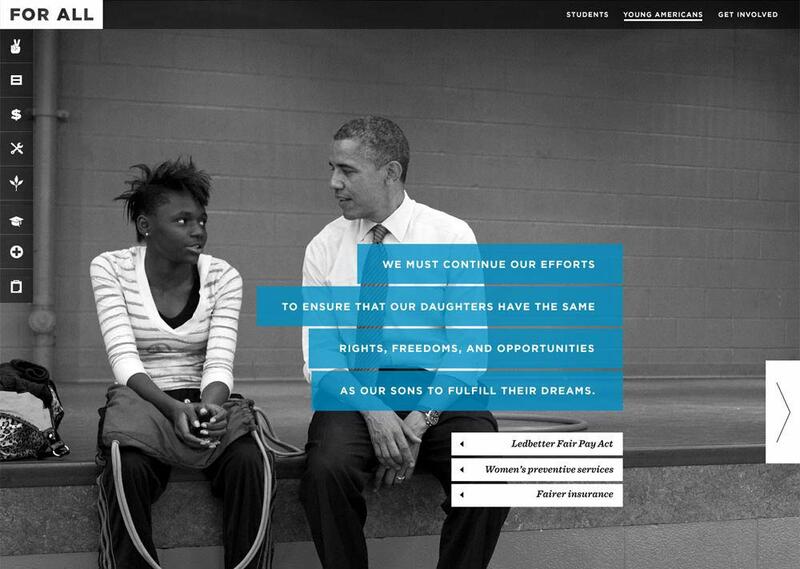 Following are several microsites I had the opportunity to design. 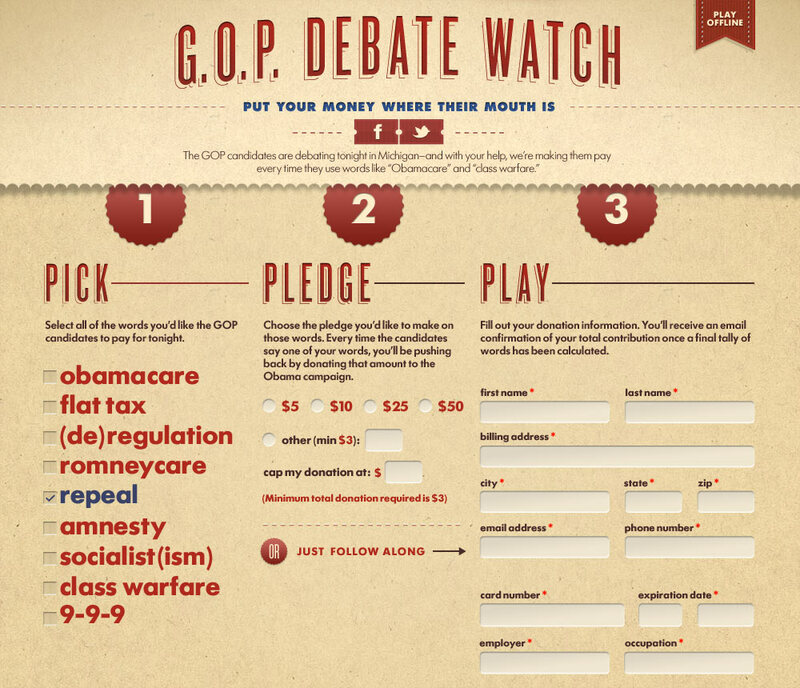 One of the more fun projects was a website that asked visitors to pledge a donation for each mention of certain buzzwords during the Republican debates leading up to the nomination. 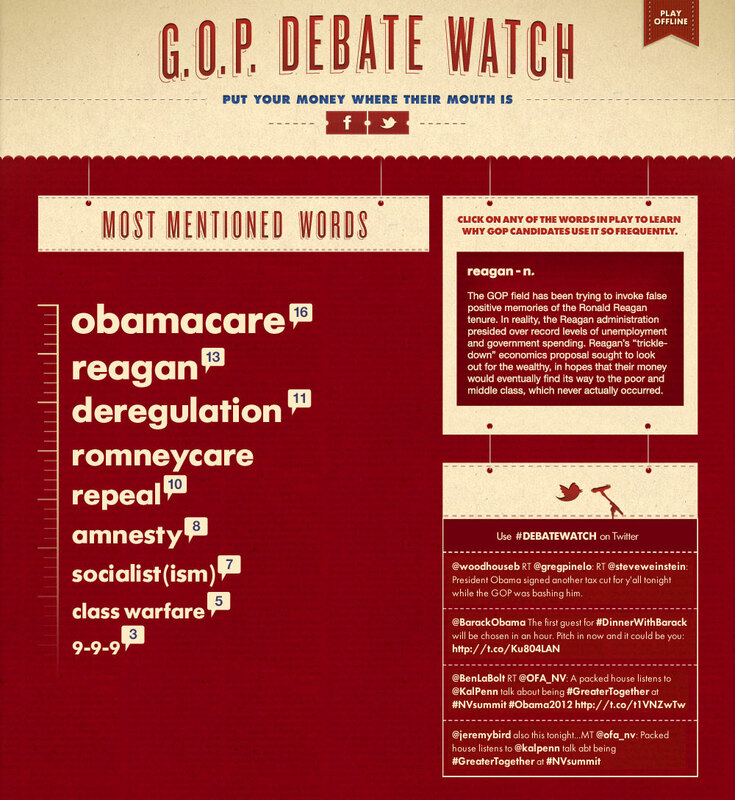 During the debates, results updated in real time with each buzzword mention. 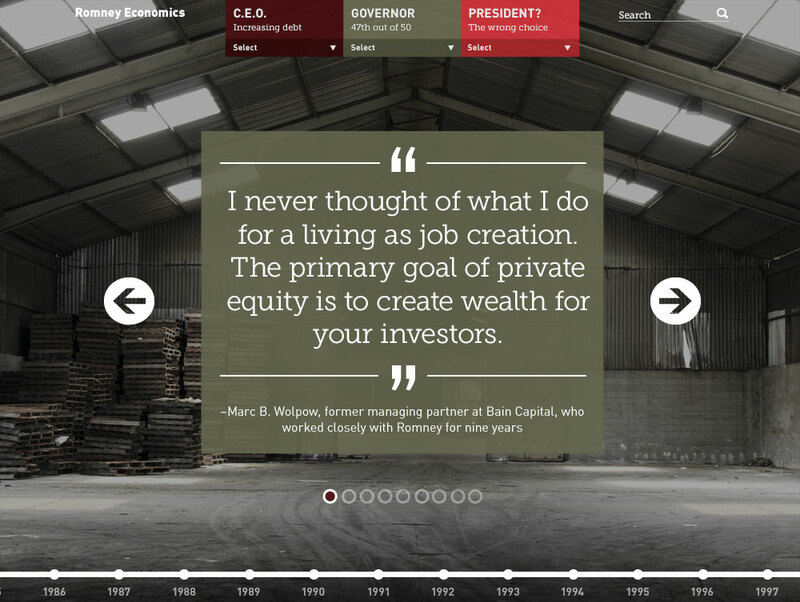 During the debates, the site updated in real time with a each buzzword mention in leaderboard format. In the political world, "surrogate" is the word for a celebrity who endorses a candidate. 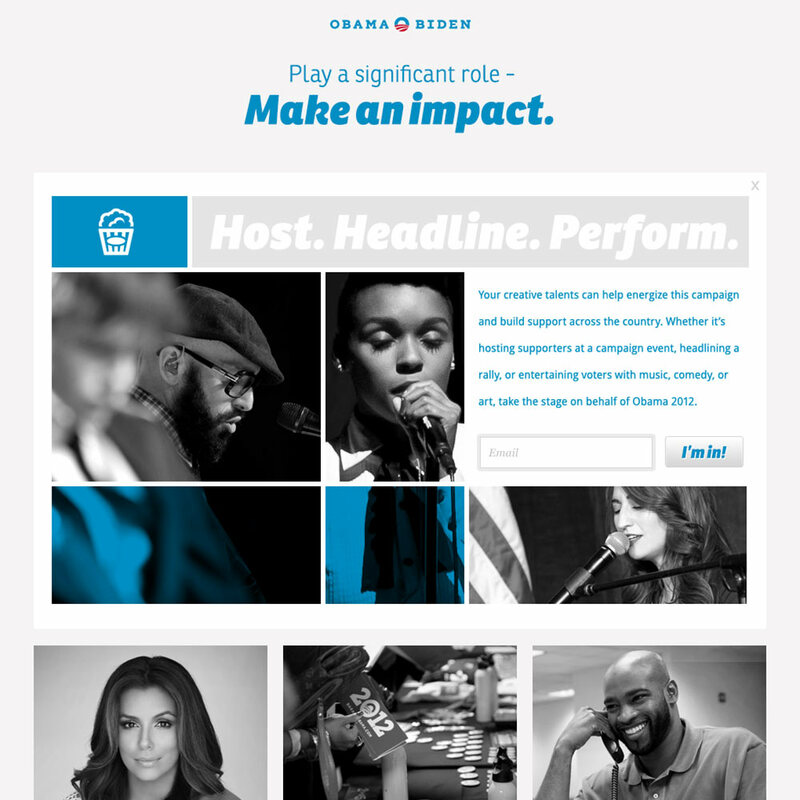 We were fortunate to have a who's who of a-list surrogates backing the campaign, and needed a website just for them, packed with ideas about how they could use their celebrity as a platform to add momentum and rally fans and followers. Working at the campaign wasn't all web stuff for me. I got the chance to help with graphic design as well. Here are some posters I made during my time there. 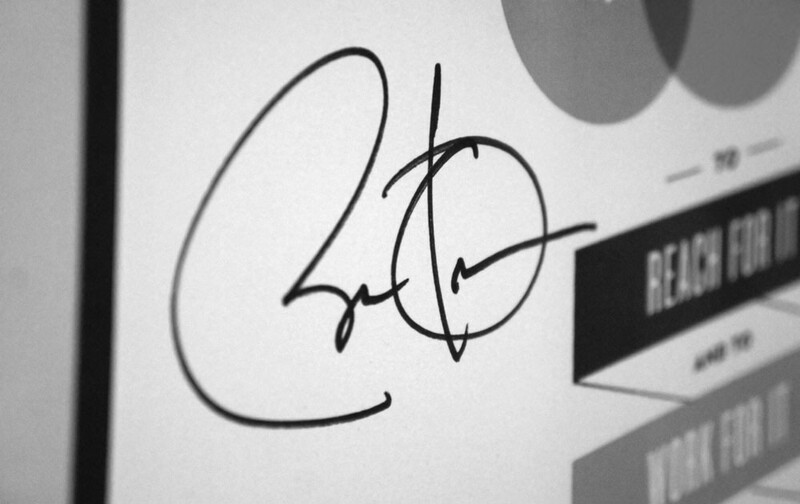 On one of the President's visits, Design Director Josh Higgins surprised me by having him autograph one for me.